Sudanese by way of Washington, DC, Safia Elhillo received a BA from NYU’s Gallatin School of Individualized Study and an MFA in poetry at the New School. Safia is a Pushcart Prize nominee, co-winner of the 2015 Brunel University African Poetry Prize, and winner of the 2016 Sillerman First Book Prize for African Poets. She has received fellowships from Cave Canem, The Conversation, and Crescendo Literary and The Poetry Foundation’s Poetry Incubator. In addition to appearing in several journals and anthologies including “The BreakBeat Poets: New American Poetry in the Age of Hip-Hop,” her work has been translated into Arabic and Greek. With Fatimah Asghar, she is co-editor of the anthology “Halal If You Hear Me." Safia is an alum and former coach of the DC Youth Slam Team, and a founding member of New York University’s Slam NYU, and has shared her work on platforms including TEDxNewYork, BBC World Service, and the South African State Theater. Safia Elhillo’s first full-length collection, The January Children, is set to released March of 2017 (University of Nebraska Press). Laolu was made famous from his collaboration with Beyonce however, it's his heritage and being born and raised in Ilorin, Nigeria to Yoruba Parents that made his Art what it is. Based in Brooklyn, NY since 2013 he's really strived to make his name in the NY Art scene. He’s a Visual Artist, Musician, Human Rights Lawyer and Activist. His motto is: “Everything is my Canvas” and takes it to heart. He puts his mark on everything from canvas, to shoes, to walls and buildings, to clothing and even the body with his Sacred Art of the Ori. There’s no separating Laolu from his Yoruba heritage, it is ever present in all his work. A strong advocate of holding onto your culture and spreading its glory he finds a way to marry his modern detail and ornate style with his Yoruba heritage by being one of the leaders in Afrofuturism Art. Laolu has worked with Beyonce on “Lemonade,” been featured in the NY Times, collborated with brands and people like: Equinox Fitness, Nike, Kenneth Cole, Alicia Keys, Taraji Henson, Jidenna, Angelique Kidjo, Black Coffee, Swizz Beatz, Danielle Brooks, Vice, Usher, Seun Kuti, Davido, Sound Sultan, Tony Allen just to name a few. Nosarieme a.k.a Nosa is an award winning television producer. She was born with an innate gift of storytelling, and fell in love with the moving image. She graduated from St. John's University with a Bachelor's in French and TV & Film. She has acquired most of her experience from roaming the world, the interwebs, never backing down from a challenge, and making tons of mistakes. She is the creator and executive producer of the award winning My Africa Is, and a freelance producer creating TV for the likes of the Travel Channel and Showtime. Anakwa Dwamena, a journalist and fact-checker, is a currently a member of the New Yorker magazine’s editorial staff. He previously worked at The Nation and The New Republic magazines where he also wrote about US-Africa politics. He reports on African immigrants in America for the online publication Africa Is A Country and is a video producer for The Nana Project, an oral history initiative to preserve and archive firsthand accounts of Ghana’s transition to independence. He is a graduate of Georgetown University in DC, where he studied Government and African Studies. Amira is a creative artist, educator, and PanAfricanist, born in Ethiopia, based in the U.S. Her work focuses on representational justice, and expanding the creative language ­­--- using creative mediums as a tool to promote alternative African narratives advocating justice and dignity. Amira received her BA in International Studies and Political Science, and MS in International Relations and Conflict Resolution. She is a Content Producer & Chief Writer at AfricaSpeaks4Africa, an independent online magazine that promotes information and issue exchange on Africa, for Africa, by Africans. Antoinette is an associate editor at OkayAfrica, an online cultural guide to all the latest music, arts, and culture coming from Africa and the Diaspora. Okay Africa connects a global audience to the African continent through compelling content and high-profile cultural events. Antoinette is a dynamic reporter and editor with an interest in the intersection of African youth culture, arts and the diaspora. Hailing from the Washington DC area, she recently graduated with a master’s degree specializing in interactive journalism and magazine writing from Northwestern University’s Medill School of Journalism. Before joining Okayafrica, she was a visiting reporter at the Weekend Argus newspaper in Cape Town, South Africa. Nikki Billie Jean (Nicolette Orji) is a Nigerian-American editor-in-chief, fashion designer, fashion stylist & event producer from Maryland (Washington, D.C. Metropolitan Area). In August 2012, Nikki founded All Things Ankara, the #1 source for ankara print fashion. Her professional and editorial work,which focuses on ankara print fashion, has been spotted on Jimmy Kimmel Live!, appeared on the websites of Huffington Post, Bella Naija & The Shade Room featured in magazines such as Clutch Magazine & Afroelle Magazine and seen on celebrities such as Grammy nominated recording artist, Jidenna and Miss USA 2015 4th Runner-Up/America’s Next Top Model Cycle 22 1st Runner Up Mame Adjei. In December 2015, she was listed on Okay Africa’s The Most Badass Black Women Moments in 2015. Essie Bartels is a spice mixologist and founder of Essiespice, a spices and sauces brand, launched in 2013 based in New Jersey. Essiespice is a culinary enterprise bringing together unlikely flavors from around the world & creating a fusion of delectable sauces & spice blends influenced mainly by West African cooking. The sauce collection adds a unique international flavor to every home cooked meal; which is carefully crafted one batch at a time. 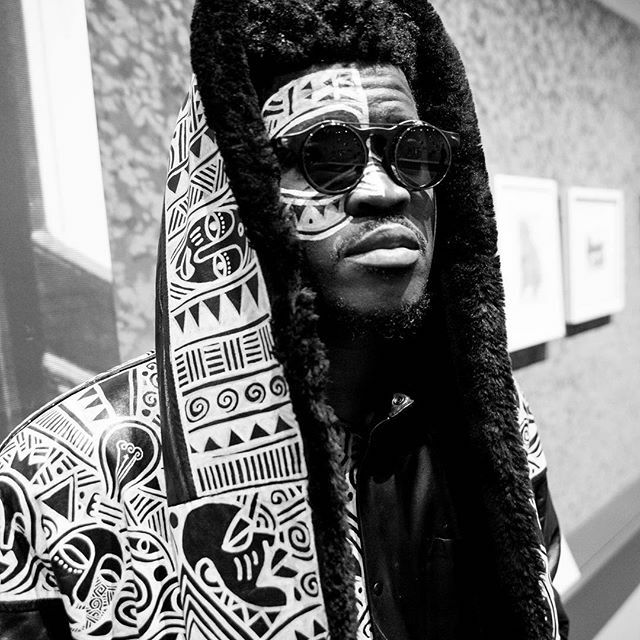 Kwadwo Adae is a visual artist, fashion villain, and international muralist. He is the founder, director, and head instructor of the Adae Fine Art Academy which also runs a Mobile Art Studio Service that provides group art lessons throughout the Greater New Haven area. Adae is deeply committed to contributing to the discourse of public art both locally and internationally by creating large scale collaborative mural projects. In the past three years he has installed 11 murals in New Haven, India, and Guatemala. Kachi Ihuegbu, professionally known as DJ Kash, is a DJ, radio personality, promoter and co-founder of Connecticut's foremost African entertainment group, Aboki Entertainment. He is the resident radio host for Yale University's "Afrobuzz Show! Afrobeats Without Borders" on WYBCX Radio New Haven and Africa Salon's resident DJ. He is also a resident DJ at GPSCY Lounge, New Haven and a regular at Harvard, Weselyan and Yale African scenes. Cosmic Homies is a Kenya-based Music Crew that together a unique sonic collaboration of funk, hip-hop, soul, jazz, tribal, and afro-beat music. Featuring TAIO, Karungari, Marushka & Joseph Kiwango, Cosmic Homies is expanding perceptions of traditional musical genres. Cosmic Homies experiments with an eclectic mix of timeless melodies, urban beats and afro soul inspiration to produce an original style of ‘Electro-Organic’ music– an homage to the collective The Soulquarians, who coined their genre as “Boho-Rap,” The four met in Nairobi, Kenya, and are mutually excited to participate in a new wave of African artists challenging stereotypes with original music. OSHUN is a Brooklyn-based neo-soul/hip-hop duo whose music preaches love, peace, and social justice. Their infectious songs and powerful live performances have cultivated a growing grassroots following leading to more than a million streams on Soundcloud and almost two million on YouTube. The name OSHUN pays homage to the Yoruba deity of fresh waters that governs over love, diplomacy, wealth, intimacy, and beauty. Inspired by other socially conscious artists such as Lauryn Hill, Erykah Badu, yasiin bey, A Tribe Called Quest, and many others, OSHUN aims to share their positive and socially conscious music with the world.